Engineers use knowledge primarily to design, produce, and operate artifacts. … Scientists, by contrast, use knowledge primarily to generate more knowledge. What Engineers Know and How They Know It (1990), 226. In Camilla Stivers, Democracy, Bureaucracy, and the Study of Administration (2001), 144. It is not only a decided preference for synthesis and a complete denial of general methods which characterizes the ancient mathematics as against our newer Science [modern mathematics]: besides this extemal formal difference there is another real, more deeply seated, contrast, which arises from the different attitudes which the two assumed relative to the use of the concept of variability. For while the ancients, on account of considerations which had been transmitted to them from the Philosophie school of the Eleatics, never employed the concept of motion, the spatial expression for variability, in their rigorous system, and made incidental use of it only in the treatment of phonoromically generated curves, modern geometry dates from the instant that Descartes left the purely algebraic treatment of equations and proceeded to investigate the variations which an algebraic expression undergoes when one of its variables assumes a continuous succession of values. Man is a part of nature, not something contrasted with nature. His thoughts and his bodily movements follow the same laws that describe the motions of stars and atoms. Opening of What I Believe (1925), 1. The Double Helix: A Personal Account of the Discovery of the Structure of DNA (1968, 1998), 14. Religion, in contrast to science, deploys the repugnant view that the world is too big for our understanding. Science, in contrast to religion, opens up the great questions of being to rational discussion, to discussion with the prospect of resolution and elucidation. 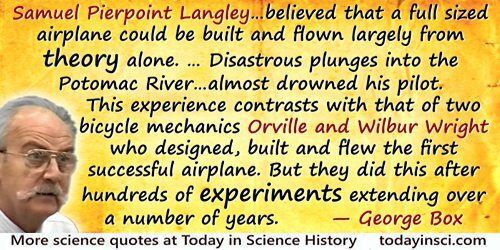 Samuel Pierpoint Langley, at that time regarded as one of the most distinguished scientists in the United States … evidently believed that a full sized airplane could be built and flown largely from theory alone. This resulted in two successive disastrous plunges into the Potomac River, the second of which almost drowned his pilot. This experience contrasts with that of two bicycle mechanics Orville and Wilbur Wright who designed, built and flew the first successful airplane. But they did this after hundreds of experiments extending over a number of years. Science is the organised attempt of mankind to discover how things work as causal systems. The scientific attitude of mind is an interest in such questions. It can be contrasted with other attitudes, which have different interests; for instance the magical, which attempts to make things work not as material systems but as immaterial forces which can be controlled by spells; or the religious, which is interested in the world as revealing the nature of God. In The Scientific Attitude (1941), Foreword, 9. That only Galileo’s physical finger is preserved but the descendants of his techniques thrive is also symbolic of the transitoriness of personal existence in contrast to the immortality of knowledge. In Galileo's Finger: The Ten Great Ideas of Science (2003), 1. The material world begins to seem so trivial, so arbitrary, so ephemeral when contrasted with the timeless beauty of mathematics. In The Mathematical Universe: An Alphabetical Journey Through the Great Proofs, Problems, and Personalities (1994), 160.